Bob Lutz on Fritz Henderson, shown: He won't starve GM product. GM's Fritz Henderson has tackled problems around the world. 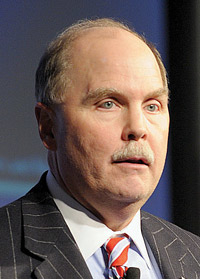 DETROIT — As tough as it is to restructure General Motors, the biggest test for CEO Fritz Henderson will come afterward. Henderson has shown the skills and temperament to cut costs, hack away dead wood and run the high-stakes negotiations to clean up GM's balance sheet and keep the company alive. But once a leaner GM emerges from this traumatic restructuring, Henderson will have another challenge, one for which his years as a globe-trotting financial fix-it man have not necessarily trained him. Can he lead the rebuilding of GM's brands, the rehabilitation of the company in the public's mind and the sale of millions of vehicles at a high profit? Henderson's post-restructuring GM will have to choose the right products and marketing to boost revenue. Can the numbers guy make things happen on the revenue side? In an interview shortly after he was named CEO, Henderson said he understands the challenge. "Nobody's ever shrunk their way to profitability in the business," he said. "Most of the time you just shrink your way to more losses." CEOs who restructure companies often depart once the dirty business is finished. At Chrysler LLC, CEO Bob Nardelli was hired in 2007 by owner Cerberus Capital Management LLP to shape up the automaker financially. But he will not be CEO of the post-bankruptcy company. Henderson's credentials in cost-cutting, restructuring and negotiations are well-established. A graduate of the University of Michigan with a Harvard MBA, Henderson — like Rick Wagoner, his predecessor as CEO — started his GM career in the automaker's treasurer's office in New York. After rising through the ranks, he took on troubleshooter assignments as head of Europe, Asia and America. Henderson became chairman of GM Europe in 2004 as a modest restructuring plan, Project Olympia, was fizzling. He spearheaded a tougher plan, cutting 12,000 jobs — including 10,000 high-wage jobs in Germany. His tenure at GM Asia Pacific from 2002 to 2004 had included delicate negotiations to extract GM from its 49 percent share of money-losing Isuzu. Working with Asian bankers, Henderson reduced GM's stake but walked away with a key prize: control of plants that make the V-8 diesel Duramax engines used in GM's full-sized pickups. Henderson also has been in the thick of bargaining with GM's bankrupt former parts unit, Delphi Corp. And at key times, he joined in the crucial 2007 negotiations with the UAW. Last week, it was Henderson who smoothed over the German government's anger over Opel's short-term cash needs. Through it all, he has remained even-tempered and matter-of-fact. His frank discussion of the possibility of bankruptcy — anathema to Wagoner — is typical. At his first press conference as GM CEO, Henderson, in his typically clipped voice, laid out the company's restructuring options: "We're not going to compromise the objectives. The objectives are clear. If we cannot do that out of court, we will do it in court." GM's departing product guru, Vice Chairman Bob Lutz, said Henderson has the right view of the importance of great product. "Don't make the mistake of categorizing Fritz as a finance guy," Lutz said last week. "He started out there, but Fritz has a lot of operating experience." In his nearly eight years of running product development at GM, Lutz has sought to overcome the company's tendency to save a few dollars on a vehicle but make the vehicle less desirable to the customer. Lutz cited Henderson's stints as head of GM's South American, Asian and European units. Lutz said Henderson doesn't pinch pennies on product. "Fritz is a leader who understands that you can't mess around with the product and take off a little bit here and take off a little bit there and maybe people won't notice and we'll have bigger margins," Lutz said. Mark Hogan, a former Lutz lieutenant who was GM's advance product chief, noted that GM is growing in some areas that Henderson ran — Asia and Latin America. "I don't think he's deficient, in my mind, in any area," said Hogan, now CEO of the Vehicle Production Group, a Miami company that makes vehicles for people with disabilities. "He's gone through all the chairs." Rebecca Lindland, senior analyst for Global Insight in Boston, said GM will need to make money with a smaller market share. Within a few years after restructuring, the company probably will level off at about 18 percent of the U.S. market, she said; GM had 19.2 percent through April. In this decade, GM's peak share was 28.6 percent in 2002. GM's yet-to-be-named new board could opt for a different sort of CEO after the company is stabilized, Lindland said: "It is not uncommon that the hatchet man that has to come in to make these very analytical, cold decisions does clean up the mess and go on to his next assignment."